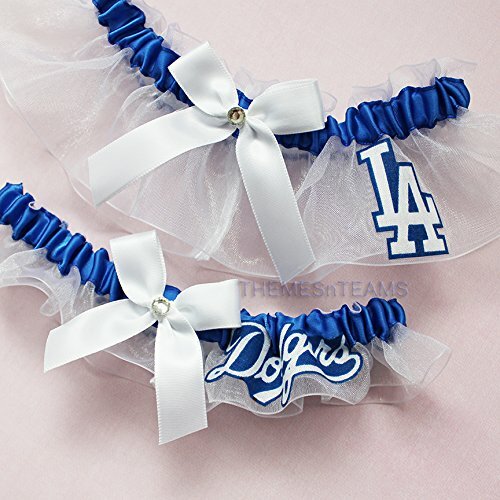 This beautiful garter set is quality hand made from a licensed cotton Dodgers print, it is not an officially licensed product. Both garters are made with blue satin on white organza and embellished with white bows and sparkly rhinestones. The wider keepsake garter features an "LA" fabric applique I made from the fabric shown and the thinner armband garter features a "Dodgers" fabric applique. Both garters are professionally finished in a French seam so there are no raw edges and the ribbons have been sealed to prevent fraying. This garter set is handmade by me using licensed fabric. They are not officially sponsored or endorsed by the brand/team they represent. My handmade items are being sold by rights granted by the US Supreme Court by the First Sale Doctrine. You will need to measure your thigh where you'd like to wear your garters, and select the appropriate size. I will do my best to make sure your garters fit you comfortably. If this is a gift and you're unsure, message me and I can help give you a better idea what might be the best fit. I've got dozens of colors available for this style along with many other charms. Feel free to contact me any time for other color combos, themes, or teams (NFL football, NCAA collegiate, NHL hockey, NBA basketball, MLB baseball, MLS soccer), or with any questions. Don't forget to check me out on Pinterest & Facebook and give me a "Like"! Thanks for looking & for supporting small American businesses like mine! If you have any questions about this product by BOYX Designs, contact us by completing and submitting the form below. If you are looking for a specif part number, please include it with your message.